This post brought to you by Chase. The content and opinions expressed below are that of Sweating the Big Stuff. According to a recent survey by Chase, a lot of Americans are getting ready to enter the property market this summer. This is good news and an indicator of confidence in the economy – people are starting to believe that the bad times are over now but still seem a little more reluctant to take the final step. We do have to wonder though whether or not they understand exactly how the mortgage markets work and what the math is. The interest rates last month topped 4% – the first time that they have done this since November 2014. The general consensus among those in the know is that there are more increases in the horizon. It could be said that hovering on the sidelines could actually cost you very dearly in the future. 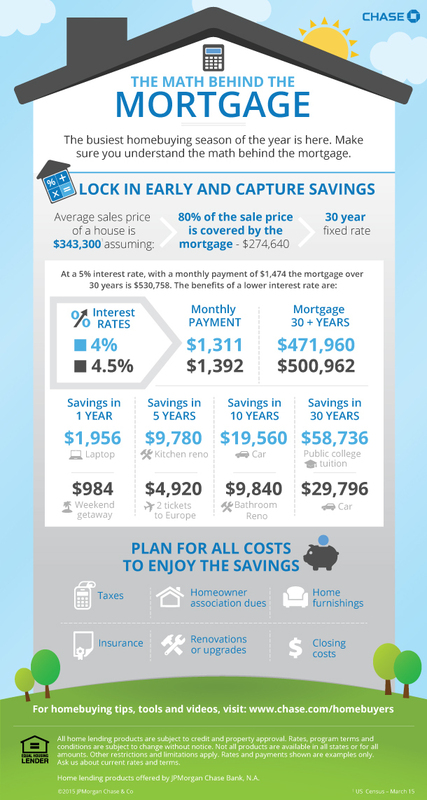 The lower the rate when you buy, the higher the potential savings that you can lock in. Even a 1% difference can mean as much as $60,000 over the thirty year term of the mortgage. If you get your mortgage now, at a rate of 4%, you can expect to pay $1,311 per month and will end up having paid $471,960 over the 30 year term. On the other hand, let’s say you wait a bit and the rate increases by another 0.5%, you will have to pay an extra $81 per month. This may not sound like a lot but, when you take it over the 30 year term, you will end up paying an extra $29,002 and that is assuming that the rate only increases by half a percent. Chase has done a lot of research into finding out what homebuyers’ actual concerns are and what their hopes are as well. One worrying statistic emerged from the same Chase survey – it was found that almost half of the respondents were not concerned about completely understanding the mortgage process. Only one-quarter of the respondents were able to answer questions related to some of the basic concepts like annual percentage rates or down payments. Too many people believe that the interest rate is the only cost when it comes to buying a home. You also need to consider that there will be transfer duties, attorney’s fees, closing costs, deposits to pay for utilities and moving costs as well. These are costs that you may need to pay out of pocket and, in addition, you may also be required to pay a deposit on the home as well. All in all, it can be a bit overwhelming for the homebuyer. Fortunately, there are tools online that can make it simpler for you from online mortgage calculators to advice on what to expect when buying a home. Check out chase.com/homebuyers to get a closer look at some of these tools.